According to the Bureau of Labor Statistics, in the 3rd quarter of this year, American workers were losing ground to inflation. Median weekly earnings of the nation’s 103.6 million full-time wage and salary workers were $758 in the third quarter of 2012 (not seasonally adjusted), the U.S. Bureau of Labor Statistics reported today. This was 0.7 percent higher than a year earlier, compared with a gain of 1.7 percent in the Consumer Price Index for All Urban Consumers (CPI-U) over the same period. Read more…. Here’s the answer. 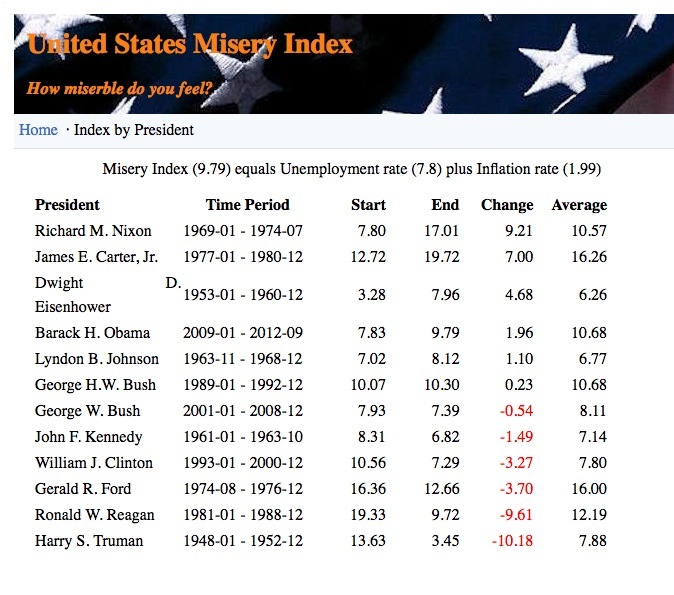 According to the Misery Index, things have gotten worse under Obama.